Bush « America, You Asked For It! That’s one narrative. I have another. 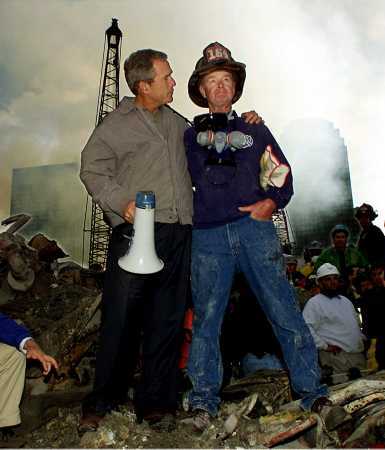 Despite being handed one of the worst situations in history from President Clinton, and being fought tooth and nail by his opponents in government and the media, literally from the day of his election, President George W. Bush persevered to restore prosperity at home and to make the US and the world more free and secure. Eagle Forum: The end of President Bush’s final term is quickly approaching. Less than two months remain until he hands over the White House keys to Barack Obama, but we cannot let him leave office without resolving one very important issue: he must commute the prison sentences of convicted U.S. Border Patrol agents Ignacio Ramos and Jose Compean! Not only do we now know that the agents did not get a fair trial and that the prosecution’s case was based on the word and testimony of an illegal drug smuggler, but the Fifth Circuit U.S. Court of Appeals upheld their mandatory minimum 10-year prison sentences for “discharging a firearm during the commission of a crime of violence.” This law, Section 924(c) of the U.S. Code, has always been interpreted to apply to criminals, not law enforcement officers engaged in their official duties. Every U.S. citizen has the right to self defense, especially those serving in harm’s way. In a surprisingly candid admission, President George W. Bush said that when he was elected to the White House he was not prepared to wage war and that one of his biggest regrets as president was the inaccurate intelligence upon which he based his decision to attack Iraq. During an interview airing Monday night on ABC’s World News, Bush also expressed regret about the global economic crisis and said Barack Obama’s election was a repudiation of his policies and the Republican Party. He also expressed remorse that the global financial crisis has cost jobs and harmed retirement accounts and said he’ll back more government intervention if needed to ease the recession. The U.S. economy fell into a recession in December 2007, the National Bureau of Economic Research reported on Monday. Many economists believe the current downturn will last until the middle of 2009 and will be the most severe slump since the 1981-82 recession. On the war in Iraq, Bush said the biggest regret of his presidency was the “intelligence failure” regarding the extent of the Saddam Hussein threat to the United States. With the support of Congress, Bush ordered the U.S.-led invasion of Iraq in March 2003 — a decision largely justified on grounds — later proved false — that Saddam was building weapons of mass destruction. During a discussion about what Americans should know about what it is like to be president, Bush was asked what he was most unprepared for going into the office. As he leaves office, Bush said he felt responsible for the economic downturn because it’s occurring on his watch, but he added: “I think when the history of this period is written, people will realize a lot of the decisions that were made on Wall Street took place over a decade or so” before he became president. He said he would like to see “instant liquidity” in the markets given the extent of the financial rescue plan, yet he understands that fear has paralyzed the markets. Last week, the Bush administration and the Federal Reserve pledged $800 billion to break through blockades on credit cards, auto loans, mortgages and other borrowing. The latest moves raised U.S. commitments to contain the financial crisis to nearly $7 trillion — though no one thinks the government will actually spend that much. The figures include loans that are expected to be repaid, loan authorities to back mortgages, purchases of stock in banks, guarantees to support loans among banks and pledges backing other transactions.